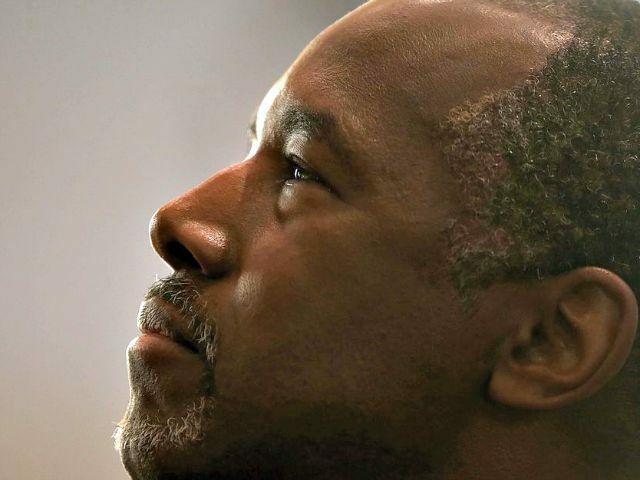 PHOENIX, Arizona — As many as 10,000 people may come out this evening to see Dr. Ben Carson speak here in Phoenix, so his campaign told Breitbart News they needed to change venues to the Phoenix Convention Center to accommodate the large crowd. Carson will be coming into town for a rally from 6 to 8 p.m. local, a rally that was originally going to be at the Grace Community Church in Tempe. But due to the overwhelming response without even any local organizers putting together the event—now 9,500 people have RSVP’ed on EventBrite, according to Carson spokesman Doug Watts—they needed to change venues to accomodate people. Shortly before noon local time, it’s just under 100 degrees fahrenheit outside here, and it’s only likely to get hotter, something that makes the expected very high turnout even more impressive. We just had an overwhelming response through the EventBrite application, and the church wouldn’t be able to accommodate everyone. With the heat, it was necessary to find a larger venue that’s indoors. By the time we found a larger venue, the number increased to 9,500 RSVPs through EventBrite so we decided to just go off and do it at the convention center. We think it’s going to be very solid, and you never know who’s going to show up with online reservations but we expect it’ll be somewhere between 5,000 and 10,000 people. Watts said that thousands of people coming out to brave the hundred-degree heat in Phoenix on a Tuesday night—with only five days notice and again, no local organizer whipping up support on the ground—is incredible and tells Carson everything he needs to know about the views Americans have of career politicians. Carson is currently in Colorado touring the Gold King gold mine EPA mineral spill, and will on Wednesday be touring the U.S. border with Mexico. “At this moment Dr. Carson is in a helicopter reviewing the Gold King spill site and the watershed and seeing what kind of havoc was wreaked on the area with this 3 million gallon toxic spill caused by the EPA,” Watts said. Today, I had the opportunity to tour by helicopter the Gold King Mine area and the Animas River watershed and get a first-hand perspective of the environmental disaster caused at the hands of our own Federal Environmental Protection Agency (EPA). I have also better learned of the short and long-term economic and potential public health impact this incident has fostered on southwestern Colorado, Northern New Mexico, and our treasured Navajo Nation. One wonders, if this accident had occurred at the hands of a private business, or even an individual property owner, would the EPA be as forgiving as they have been of themselves? I think not. The citizens, businesses and peoples relying on the vitality of the Animas River deserve complete, transparent and expeditious accountability on this matter from the EPA, and full compensation and reparations as the EPA would and has exacted from private business entities in similar instances. Further, I suggest that these reparations be paid from fines collected by EPA, and not by additional tax dollars from the General Fund. The EPA must face the same consequences and same accountability as they require of each of us. The new EPA Mission Statement from Carson has four values, and as the world’s leading pediatric neurosurgeon, Carson’s new EPA values read like the hippocratic oath doctors take. After Tuesday evening’s rally in Phoenix, on Wednesday, Carson is headed to the U.S. border with Mexico on a “fact-finding mission,” Watts said, to learn more about what is needed to secure the border and stop illegal immigration. Carson will be taking a helicopter tour and the only news organization joining him on it will be Breitbart News, bringing exclusive behind-the-scenes reporting from the ground and in the air on the border with Carson.